Hospitals are concerned their clinical documentation and coding processes are resulting in lost or decreased revenue, a new survey shows. Hospital leaders are concerned that their organization’s clinical documentation and coding processes are vulnerable to errors that could result in lost or decreased revenue, according to a recent survey. Consulting firm and technology vendor BESLER recently partnered with HIMSS Media to identify the greatest industry challenges and potential opportunities for revenue cycle improvement. They surveyed over 100 leaders within finance, revenue cycle, reimbursement, and health information management (HIM) departments at hospitals and acute-care facilities in October 2018. The recently released survey results showed that 84 percent of respondents believe clinical documentation and coding are high or medium revenue cycle risk. Hospital finance leaders were the most adamant that clinical documentation and coding presented significant revenue cycle challenges. Almost one-half of finance leaders chose clinical documentation and coding as their greatest revenue cycle vulnerability. Although, the area was considered high or medium risk by over one-third of revenue cycle, reimbursement, and HIM leaders as well. Clinical documentation and coding are creating revenue cycle vulnerabilities because solutions are not optimized for the diagnosis-related group (DRG) payment system, respondents shared. Only about one-third of hospital leaders said DRG optimization is a solved problem. In other words, the majority of hospital leaders (68 percent) do not think their solutions are equipped to manage DRG coding. The DRG payment system has been around for over three decades. And major payers, including Medicare, use the payment system to determine lump-sum payments for hospitals that treat specific diagnoses. While the payment system is not new, it is constantly evolving. Payers are attempting to get more specific about diagnoses to ensure hospitals are paid accurately for treating patients with certain conditions. The introduction of ICD-10 in 2015 is a prime example of how the industry has changed the DRG payment system. But DRG changes are not ideal for providers. Hospitals find it difficult to follow and comply with constant DRG changes, and as a result, DRG coding accuracy has decreased. The report stated that the national benchmark for DRG assignment fell from 95 percent under ICD-9 to 72 percent in 2018. Revenue cycle solutions, however, are optimized for inpatient coding and audits. Approximately 72 percent of respondents felt their technology is optimized for inpatient coding. The survey also uncovered that respondents thought the accuracy of inpatient coding at their organizations was about the same as the industry benchmark. Additionally, the majority of respondents (72 percent) agreed that their revenue cycle solutions are optimized for outpatient coding. Opportunities to improve revenue cycle management technology remain. 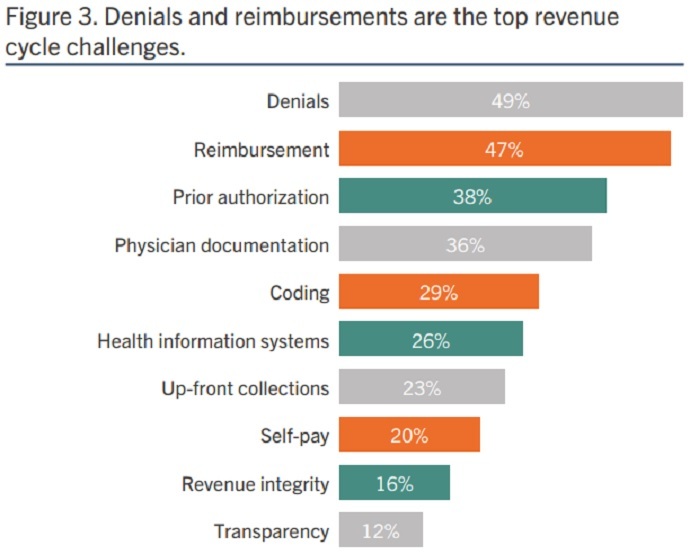 And poor coding integrity could result in the top two challenges hospitals face: claim denials (49 percent of respondents) and inaccurate reimbursements (47 percent of respondents). However, hospitals and health systems face significant obstacles with improving their mid-revenue cycle processes, including DRG coding and documentation. Chief among the challenges is a lack of budget. Nearly one-half of hospital leaders (49 percent) said budget constraints prevented their organization from improving DRG coding and documentation. Nearly the same percentage of leaders also felt return on investment (ROI) was an obstacle. Forty-eight percent of respondents said difficulty proving ROI from investment stopped their organization from executing DRG optimization efforts. Respondents identified a variety of challenges, but the survey also found a potential solution for hospitals and acute-care facilities. The survey showed that nearly half of respondents (47 percent) have created a revenue integrity program, which ensures organizations are being fully compliant with coding and billing practices while also achieving operational efficiency and legitimate reimbursement. That means about 53 percent of hospitals still haven’t implemented a revenue integrity program. About three-quarters of hospitals with revenue integrity programs reported improvements in net collections, increases in gross revenue capture, and/or reduction in compliance risk. Allentown, Pa.-based Coordinated Health and its founder and CEO Emil DiIorio, MD, have entered into an agreement with the federal government to settle False Claims Act allegations, according to the Department of Justice. The settlement resolves allegations that Coordinated Health inflated payments from federal payers by unbundling claims for reimbursement for orthopedic surgeries, including many for total joint replacement, from 2007 through mid-2014. Instead of stopping the illegal unbundling, Dr. DiIorio changed how he wrote operative reports to enable Coordinated Health billers to maximize improperly unbundled reimbursements, according to the Justice Department. Two outside coding consultants identified the improper unbundling during audits in 2011 and 2013 and told top Coordinated Health executives about the problem. “Motivated by its bottom line, Coordinated Health simply ignored the consultants’ recommendations and continued abusing Modifier 59 to improperly unbundle orthopedic surgery claims until mid-2014,” states a Justice Department press release. Coordinated Health will pay $11.25 million and Dr. DiIorio will pay $1.25 million to settle the allegations. In addition to the monetary settlement, Coordinated Health entered into a corporate integrity agreement with HHS that will require monitoring of its billing practices for five years. Hospital expenses are rising faster than revenue growth for health systems, resulting in declining operating income. Health system operating income is deteriorating as hospital expenses continue to grow, according to a recent Navigant analysis. In the three-year analysis of the financial disclosures for 104 prominent health systems that operate almost one-half of US hospitals, the healthcare consulting firm found that two-thirds of the organization saw operating income fall from FY 2015 to FY 2017. Twenty-two of these health systems had three-year operating income reductions of over $100 million each. Furthermore, 27 percent of the health systems analyzes lost revenue on operations in at least one of the three years analyzed and 11 percent reported negative margins all three years. In total, health systems facing operating earnings reductions lost $6.8 billion during the period, representing a 44 percent reduction. Rapidly growing hospital expenses as the primary driver of declining operating margins, Navigant reported. Hospital expenses increased three percentage points faster hospital revenue from 2015 to 2017. Top-line operating revenue growth decreased from seven percent in 2015 to 5.5 percent by 2017. Hospital revenue growth slowed during the period because demand went down for key hospital services, like surgery and inpatient admissions, Navigant explained. Many of the revenue-generating services hospitals rely on are under the microscope. Policymakers and healthcare leaders are particularly looking to decrease the number of hospital admissions and safely shift inpatient surgeries to less expensive outpatient settings. In exchange, Medicare and other leading payers are reimbursing hospitals for decreasing admissions or readmissions and their performance on other value-based metrics. The shift to value-based reimbursement, however, is slow and steady, with just over one-third of healthcare payments currently linked to an alternative payment model. Hospitals and health systems are still learning to navigate the new payment landscape while keeping their revenue growing. Value-based contracts also failed to deliver sufficient patient volume to counteract the discounts given to payers, Navigant added. According to the firm, other factors contributing to a slowdown in hospital revenue growth included a decline in collection rates for private accounts and reductions in Medicare reimbursement updates because of the Affordable Care Act and the 2012 federal budget sequester. While hospital revenue growth slowed, hospital expenses sharply rose as healthcare organizations invested in new technologies. Value-based reimbursement, federal requirements, and other components of the Affordable Care Act prompted hospitals to make strategic investments in EHRs, physicians, and population health management, causing expenses to increase, Navigant stated. “In addition to these strategic investments, other factors drove up routine patient care expenses, including a nursing shortage that increased nursing wages and agency expenses; specialty drug costs, particularly for chemotherapeutic agents; and, for some systems, recalibration of retirement fund costs,” the report stated. The shift to value-based reimbursement and all of its accompanying policies will be the “new normal,” and hospitals should expect the low rate of revenue growth to persist, Navigant stated. But hospitals and health systems can withstand the economic downturn by achieving strategic discipline and operational excellence, the firm advised. In line with strategic discipline, organizations will need to “prune” their owned assets portfolio by improving the utilization of their clinical capacity and growing patient throughput. Health systems can achieve this by focusing on scheduling and staffing, ensuring adherence to clinical pathways, streamlining discharges and care transitions, and adjusting physical capacity to actual demand. The tools used to succeed in value-based contracts should also be applied to Medicare lines of business to reduce Medicare operating losses. Additionally, vertical alignment will be key to weathering falling operating earnings, Navigant explained. Reducing patient leakage in multi-specialty groups and systems through improved referral patterns, scheduling, or care coordination will help to grow revenue and keep it within the system. One of the country’s largest suppliers of oxygen and respiratory equipment has agreed to pay $5.25 million to settle allegations that it violated anti-kickback laws by reducing copayments for certain Medicare Advantage members. Lincare has also entered into a corporate integrity agreement with the Office of Inspector General, the Department of Justice announced last week. The settlement resolves allegations filed by former billing supervisor Brian Thomas, who worked for nearly a decade at the Florida-based company. In his 2015 complaint, which was later joined by federal prosecutors, Thomas claimed Lincare waived copays for Humana’s Medicare Advantage members beginning in December 2011 after the insurer contracted with Apria Healthcare to be an exclusive in-network provider of medical equipment. In his complaint, Thomas said Lincare matched network benefits by reducing copays from Humana beneficiaries from 30% to 13% to align with copays from Apria. Humana was left paying for a higher charge using government funds. Lincare was purchased by The Linde Group, a German industrial gas company, for $3.8 billion in 2012. The government alleged Lincare continued the scheme through 2017. It’s the second major settlement for Lincare, which operates about 1,000 locations across the country. In May, the company paid $875,000 to settle a class action lawsuit from employers who had their information stolen during a data breach. But the approach that company is using is drawing attention from lawmakers and Missouri’s auditor. It is similar to a tactic underway at 20 rural hospitals in Missouri, Kansas, Oklahoma, Florida and California. Read KHN’s previous coverage of this topic: “Outsiders Swoop In Vowing To Rescue Rural Hospitals Short On Hope — And Money” by California Healthline senior correspondent Barbara Feder Ostrov. Whistleblower lawsuits had alleged that the Florida-based wound care specialist knowingly filed bogus claims to Medicare for services that weren’t needed. 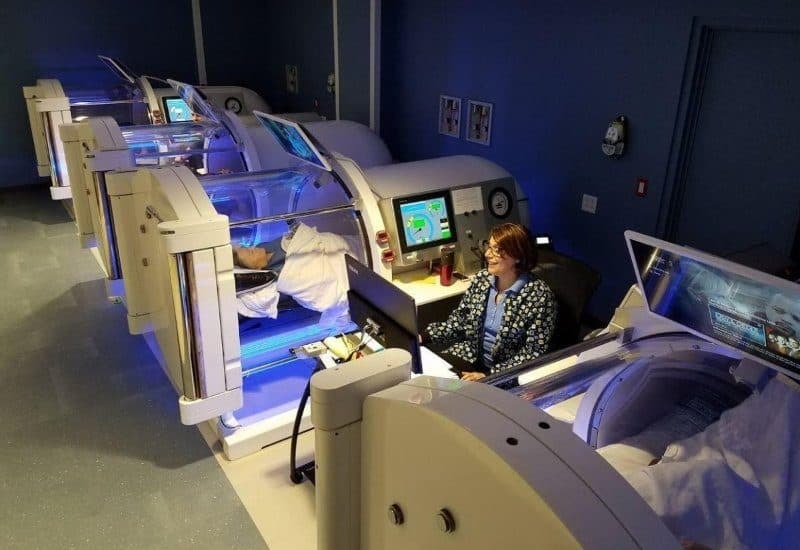 Healogics, Inc. will pay up to $22.51 million to settle whistleblower allegations that billed Medicare for medically unnecessary and unreasonable hyperbaric oxygen therapy, the Department of Justice said. Jacksonville, FL-based Healogics manages nearly 700 hospital-based wound care centers across the nation. The settlement resolves allegations that from 2010 through 2015, Healogics knowingly submitted false claims to Medicare for medically unnecessary or unreasonable HBO therapy, DOJ said. Healogics will pay $17.5 million, plus an additional $5 million if certain financial contingencies occur within the next five years, for a total potential payment of up to $22.51 million. The company has also has entered into a five-year Corporate Integrity Agreement with the Department of Health and Human Services Office of Inspector General. “When greed is the primary factor in performing medically unnecessary health care procedures on Medicare beneficiaries, both patient well-being and taxpayer funds are compromised,” said HHS OIG Special Agent in Charge Shimon R. Richmond. The settlement came as the result of whistleblower lawsuits filed by a former executive at Healogics, and a separate suit filed by two doctors and a former program director who worked at Healogics-affiliated wound care centers. The four whistleblowers are expected to share $4.2 million of the settlement.